Oak cask maturation not only gives the beer it’s colour, it transforms the flavour compounds in ways unlike anything else. In the case of Innis & Gunn’s annual Highland Cask, the beer is stored for 49 days in a previously used Highland scotch Cask — note that the original Innis & Gunn is stored for a longer period, but in a previously unused oak cask. 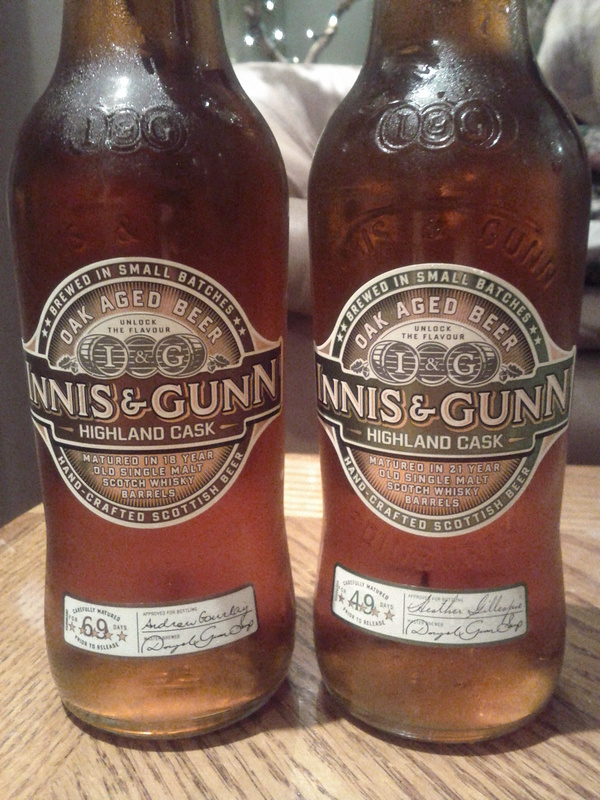 While Innis & Gunn do not reveal the source of their Highland cask — the distillery or whisky used — those who are familiar with Scotch may be aware that the Highland area of Scotland is typically known for producing rich, subtlysweet, unpeated/mildy peated whisky. 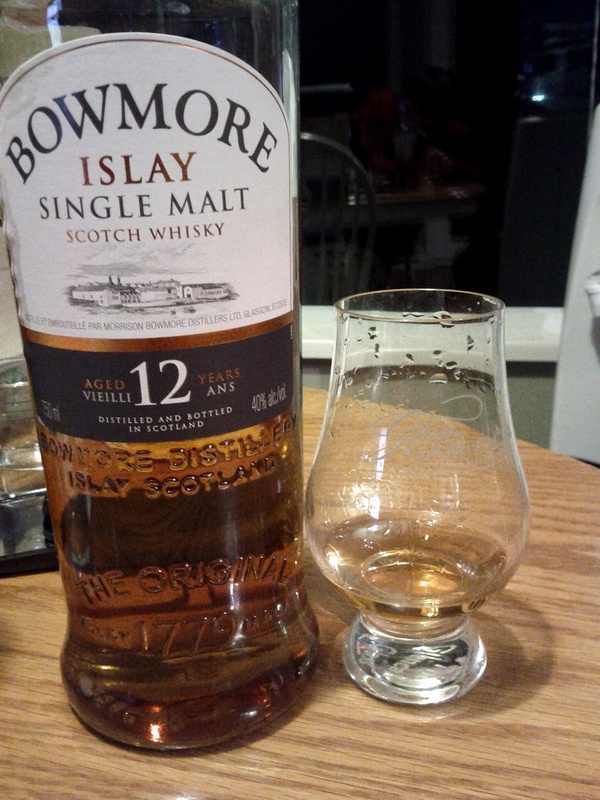 Herein we are reviewing the 2010 edition, which was aged in a 21 year old Highland cask; the bottle has therefore been sitting idle for about a year, and, since the alcohol by volume (ABV) is not nearly high enough to preserve it indefinitely, some minor changes may have occurred. Nonetheless, we each strive to appreciate and score the products we review by focusing squarely on 4 characteristics — nose, body, flavour, finish; we do not allow preconceptions or politics to interfere with our judgement. 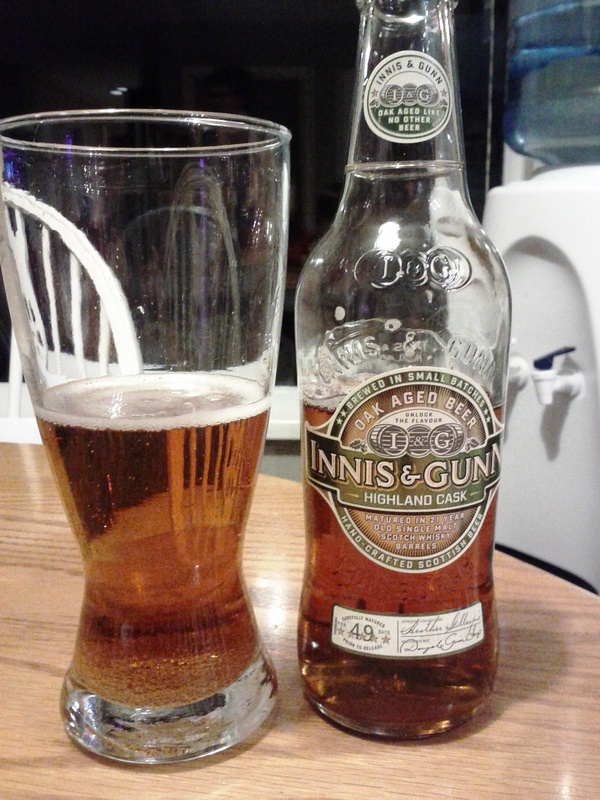 Innis & Gunn is perhaps my favourite beer producer — it’s a toss up between them and Phillips — and, as a whisky enthusiast, the annual Highland Cask is, to me, amongst the pinnacle of beer creation. While I’m not nearly as big of a fan of the 2010 edition as I am of the newest (2011, 18 year cask) one — perhaps it’s the softening effect that an extra 3 years of oak maturation admits, or the fact that we drank a bottle that was a year old — I was still pleasantly satisfied with this particular Innis & Gunn beer. 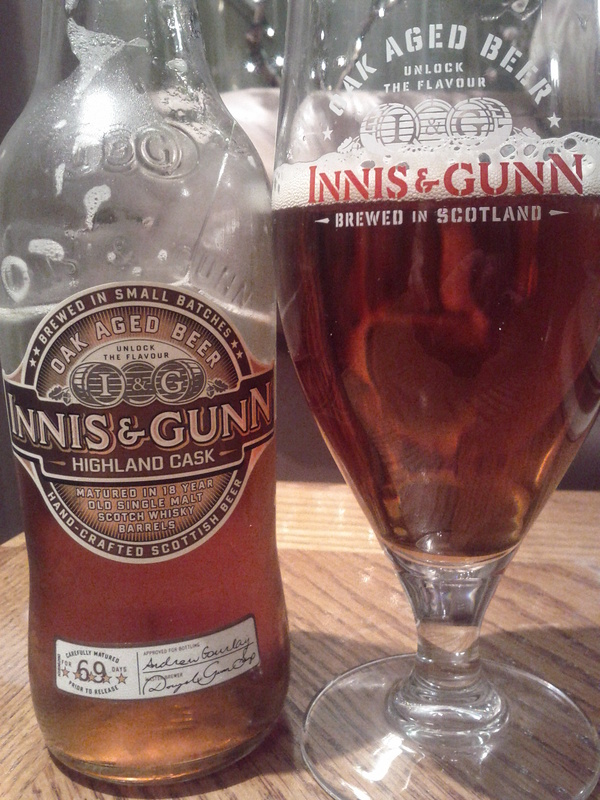 Boasting many typical Innis & Gunn characteristics, the 2010 Highland Cask emits a bouquet of vanilla, caramel, and toffee, is rich, full bodied, and complex — best when *sipped* at somewhere between refrigerating and room temperature — and has a long lasting, savoury finish. 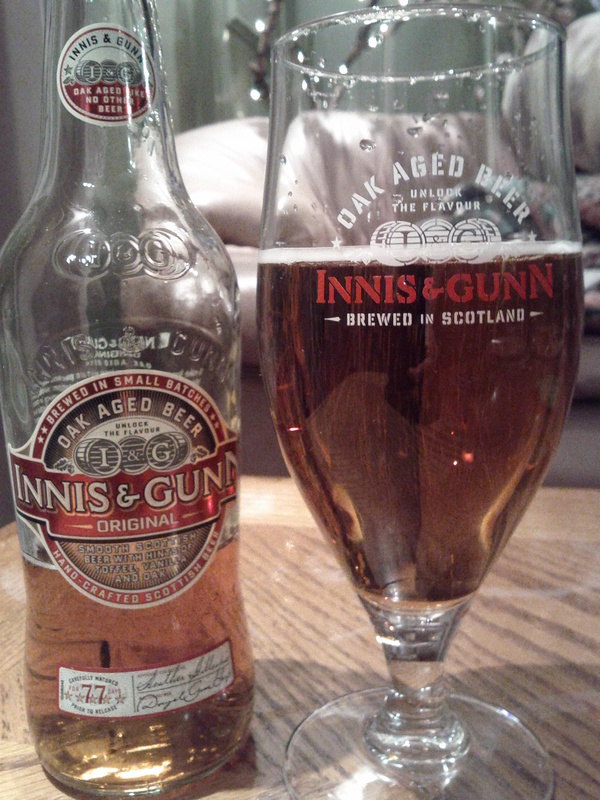 Unlike the original or 2011 edition, this Innis & Gunn hosts notes of citrus on the nose and palate, somewhat reconcilable with Innis & Gunn’s Spiced Rum Finish (appears in the 2011 Winter 3-pack). While the palate is somewhat more refined and complex than the 18 year Highland Cask from this year, it is also somewhat lighter, more fruity-citrusy, and less caramel-vanilla-toffee-like. This only proves how each cask provides a different flavour profile for the product stored within it; the particular cask, where it’s from, what it was previously used for, where it’s stored, and how long the aging lasts: all these things make a difference, and this unique Innis & Gunn beer is one not to be missed — count yourself lucky if you can find one! 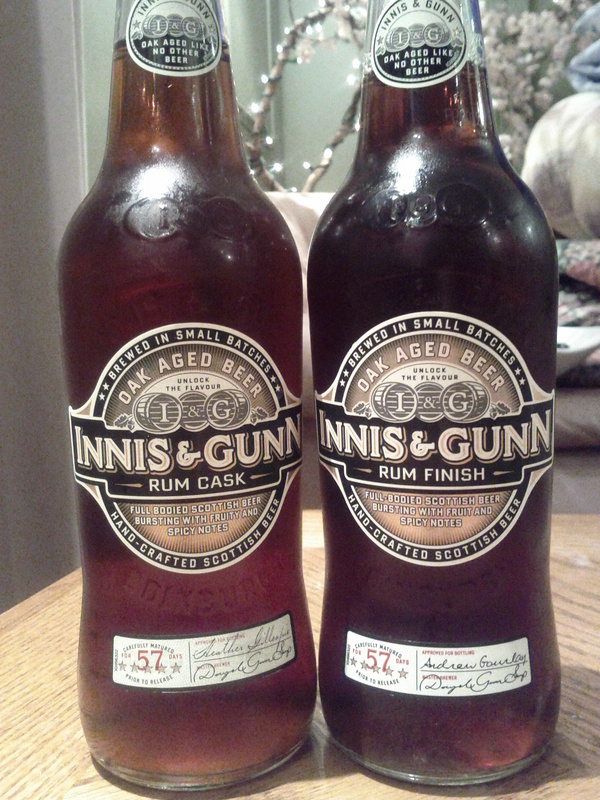 Since 2003 Innis and Gunn have made their mark in the beer world. This particular edition of their limited releases is a personal favourite of mine. Aged 49 days in the cask, as Kamran’s intro wonderfully describes, this honey coloured beer is light, smooth and has little head when poured, yet still full-bodied. This strong beer is fruity and sweet in its nose compiled of a toffee, caramel and vanilla aroma that causes anyone to greatly anticipate the moment of the first sip. The complexity of vanilla, oak and bitter notes are masterfully captured and blended in the flavor. The aftertaste on the palate is balanced between one of oak, and a spiced vanilla nature. Certainly a refreshing and smooth feeling/tasting experience. If you have read my piece in the About section, you will know that there are few beers that can make a threshold of 90 or above, so anything that comes close should be considered noteworthy. 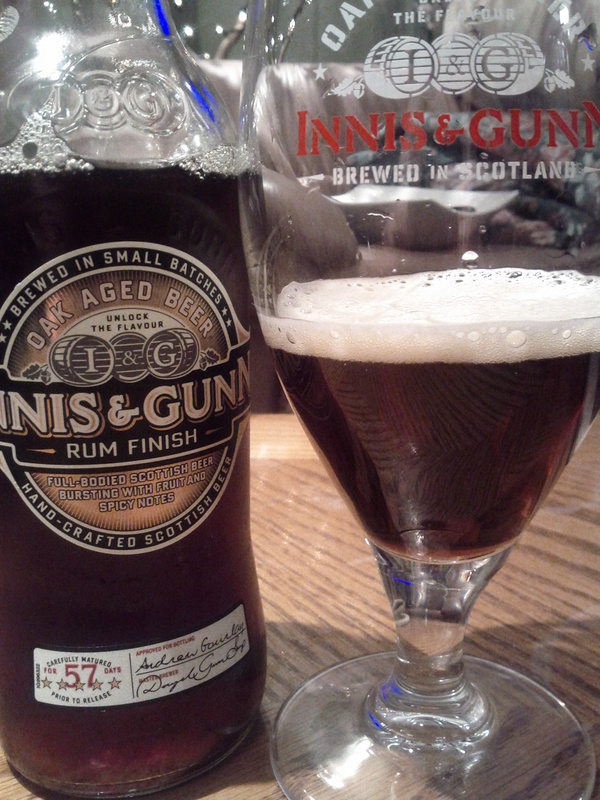 This is the case with the Innis & Gunn 21yr Highland Cask, as its highly unique arouma combined with a one-of-a-kind flavour make it a special drinking experience. The influence of the Highland Cask is easily detected right from the start, as the scent of this beer bears a striking resemblance to that of a strong spirit. As you proceed to the tasting, you find a full bodied, yet smooth beer, which gives the illusion that you will be enjoying a very heavy drink, when in fact the beer is surprisingly light, giving it a higher consumption factor. 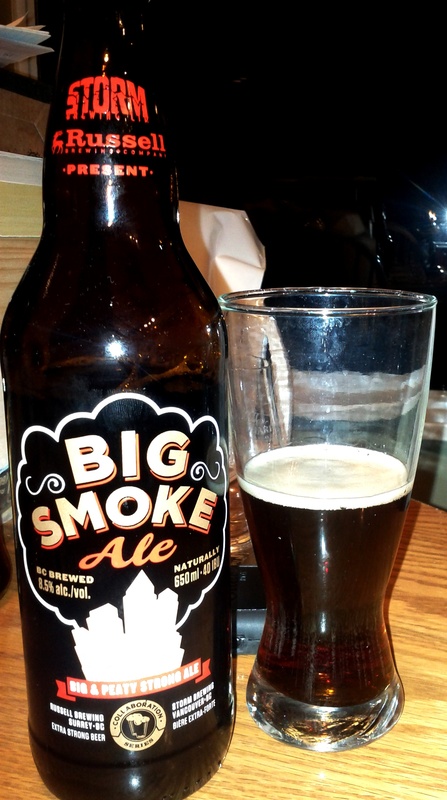 This is emphasized by the beer’s distinctive caramel overtones, which are strong enough to notice, but are not overpowering, allowing you to enjoy the taste over a prolonged period. The finish continues this sensation, with a light bitterness to tell you that you should take another sip!